Of the hundreds, perhaps thousands, of resistance exercises that have sprung from man's inventive mind, the most popular of them all may very well be the bench press. To judge from its current popularity, an understandable assumption would be that the exercise is one of truly ancient origin - one which has been refined and perfected over decades of use. This assumption, though logical, would be false. The fact, as our grandfathers used to say, of the business is that the bench press was practiced very little until after World War II. 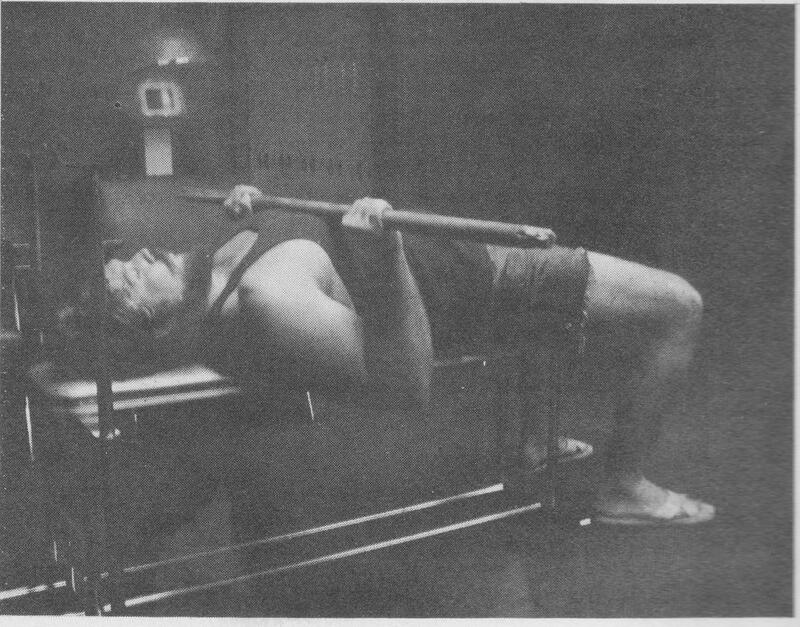 To be sure, there were isolated instances of such variations of the bench press as the "belly toss" being practiced by such stalwarts of the iron game as Joe Nordquest and, even earlier, George Lurich, the Russian wrestler, but these were the exception rather than the rule. An even better indicator of the rather low regard in which the bench press was held can be found in the pages of Karl Mueller's book, "Goerner the Mighty" in which we are told that the phenomenally strong Hermann Goerner - 260 pounds of sinew an bone - his best in the press on bench was 330 pounds! The main thing to be noted here is not that Goerner undoubtedly never practiced the lift but that a man of such unquestioned and, at the time, unparalleled total body strength would ever allow his biographer to so much as mention out loud the fact that the "strongest man in the world" could only bench press 330 pounds, much less write it in a book. 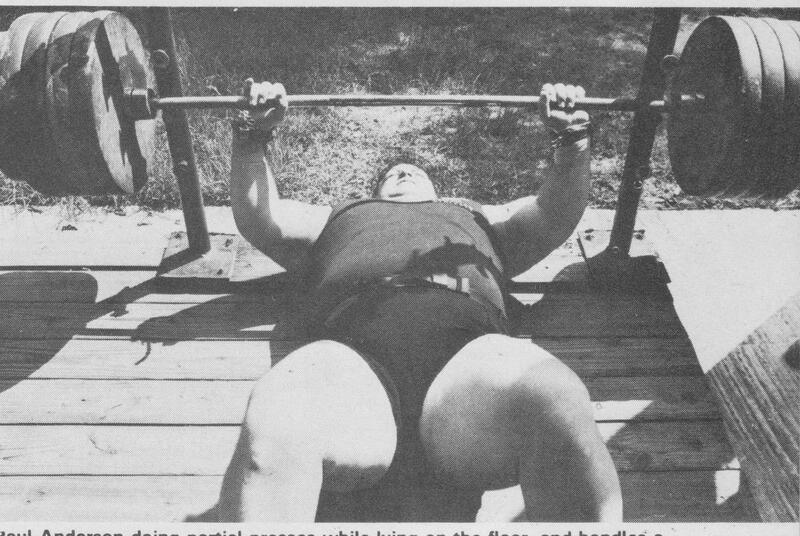 The only possible explanation is that the bench or supine press was up until the second World War, simply not a very important exercise and so a lift of 330 pounds wouldn't have been such an embarrassment to a world renowned strongman like Goerner. Lest any of our young readers get the wrong idea about Mr. Goerner, however, a brief description of one of his stunts is herewith presented. Goerner had a solid, heavy, non-revolving globe-ended barbell with a 2.75 inch handle. He could, at any time of the day or night, with or without warmup, over a time span of 20 years, easily power clean and push press this 330.75 pound mass of awkward iron. It seems to us that there are several reasons for its current popularity. First among these is that the exercise really works - it is without question one of the very few finest upper body exercises in existence. Secondly, the bench press is one of the easiest of all barbell exercises - of the six competition lifts it requires less, by far, of the lifter. Finally, the official recognition during the last decade of the bench press as one of the three power lifts provided A.A.U. sanction for this already popular and productive exercise. Having briefly established the how and why of the bench press' fame and favor, let's get on down into the how and why of improving your own ability and development from this deservedly famous exercise. Accordingly, we well focus our attention in this first article on an analysis of the drive from the chest. The ability to lift any given weight in any given exercise is generally considered to be a combined function of the strength of the muscles performing the movement and the leverage with which the muscles have to work in order to perform the movement. It would follow that two people with equal strength but unequal leverage in any given lift would not have the same ability in the lift. Or that two people could conceivably lift the same amount if the strength advantage of the one man offset exactly the leverage advantage of the other. A concrete example of how this works is easily seen in the use of elbow and arm wraps [feel free to update here] in the bench press. Some lifters argue that elbow wraps serve not to increase ability but to prevent injury and though this is occasionally true, such wrapping is done primarily in order to register a higher lift. This is not to say that a lifter should be chastised for this - far from it. If the rules allow wrapping, a lifter has the right, perhaps even an obligation, to use wraps if they increase ability. The way in which elbow and arm wraps aid the lifter may be in a way not fully realized even by those who use them. We've heard many lifters say that by tightly wrapping the elbows and arms with ace bandage the arms are made harder to bend and easier to straighten and that the greater performance ability in the bench press results from the tendency of the wrapped arm to straighten out "almost by itself." This seems to us to miss the main point, which is simply that wrapped arms are noticeably thicker when doubled up at the bottom of the lift prior to driving the bar off the chest. This thickening provides a leverage cushion from which the weight can more easily be propelled upwards than would be the case were the arms unwrapped. By now some of you have probably taken the logical step and concluded that since only a limited amount of wrapping is allowed and since wrapping helps you lift more because it makes your arm thicker, a sensible and effective way to increase your bench press would be to increase the size of your arms. If you took the step, it was a step well taken, because larger arms and a thicker shoulder girdle will increase your ability in the bench press irrespective of any gain in strength. Our thesis is that there are two ways to increase your ability in the first part of the bench pres - the drive from the chest: One is the usually stressed method of strengthening the muscles which perform the bench press (pectorals, front deltoids, triceps, etc.). The other is the equally important but little understood method of improving the leverage with which the work of the bench press is done. Let's look first at the leverage factor. At the bottom position in the bench press, the muscles of the shoulder girdle (primarily the latissimus dorsi and the teres major and minor) are wedged solidly against the triceps, and the biceps of the arms are supporting the musculature of the forearms. Any exercises which can be done to increase the size of these four muscle areas will pay off in higher lifts in the bench press. An almost universal truth is that the great bench pressers of the world are unusually thick and massive in all four of the above-mentioned areas. This thickness is as much, if not more, a reason for rather than a result of their ability in the bench press. Check through routines of people who have high numbers in this particular lift and you'll almost always find that shoulder girdle and arm work play a central role in their training programs. 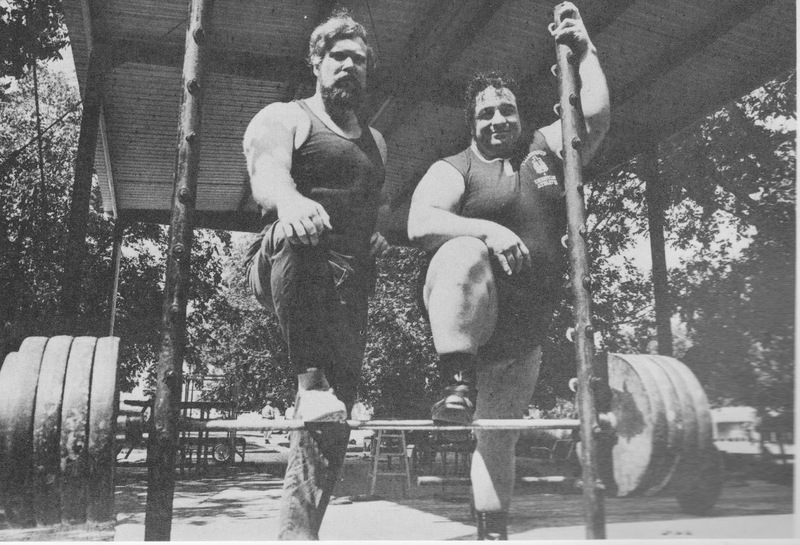 It's interesting but not surprising to note that both Jim Williams and John Kuc are careful to include lat work and arm work in their routines. Pat Casey, the first man to officially bench press 600 pounds, spent a lot of time doing wide grip chins behind the neck for his lats, and a lot of time doing triceps work for his arms. Ronnie Ray, a former world record holder in the bench press in both the 181 and 198 pound classes, almost always finished up his training sessions by pumping his arms with one of several super-sets he alternately employed to stimulate growth of his biceps and triceps. We could go on and on but the point should by now be clear. If you crave a big bench press, spend a little time with a good arm routine, and don't fail to put in at least a few regular licks on either the chin or the wide grip bentover row or both. Several sets of from five to 11 reps in the chin (add weight when necessary) and the bentover row seem to give generally good lat growth. Another matter involving leverage in the bench press has to do with how far the top of your chest is from the level of the bench. Generally speaking, a man with a large rib cage has an advantage because he has a shorter distance to lift the weight. So, two tactics would follow. For one thing, you might attempt to do a little work on high repetition squatting to get yourself winded, and intersperse that with straight arm pullovers. This combination is hard to beat for increasing the size and height of your rib cage. During the lying pullovers be sure to focus on trying to raise the height of your ribcage while keeping your back on the bench. These pictures demonstrates a relatively simple way to increase your bench press poundage by improving leverage. In this photo Dr. Todd is lying on the bench in what appears to be a perfect position for driving off the chest . . . 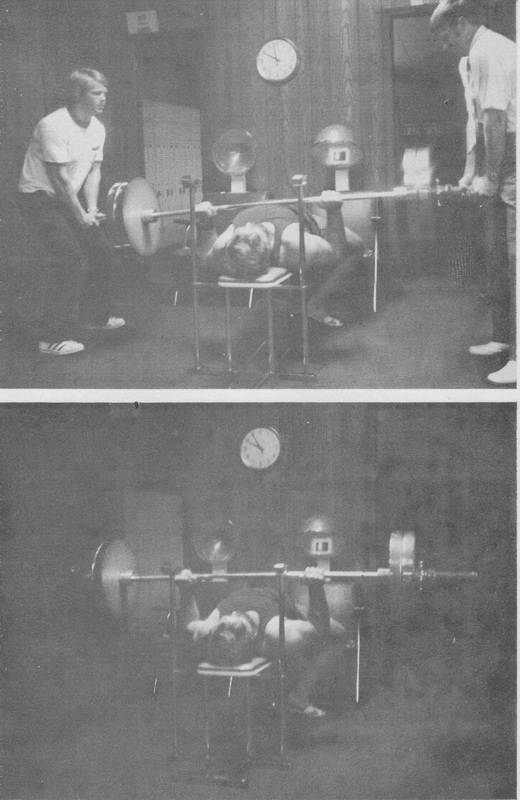 In this photo, however, he illustrates that by bringing his head and shoulders closer to the hips, the bar is raised several inches (notice lockers in background) off the chest, even though the bar is still resting on his chest. In other words, attempt to get your buttocks and shoulders as close to each other as you can, thereby forming an arch from which your bench press can be driven more easily to arms' length. This posture on the bench aids performance in another way as well because it means that you are pressing the bar slightly downward rather than straight up or perpendicular to the body as would be the case if you were laying flat on the bench. The muscles of the chest, shoulders and arms are a bit stronger in this position. This can be substantiated by noting that, generally speaking, more can be bench pressed than can be incline pressed and more can be incline pressed than can be overhead pressed. Each added degree of incline decreases ability and vice versa. Turning now to the strength factor of the drive from the chest, we'd like to suggest several exercises which have worked well for many successful lifters. This form of exercise, popularized by Bob Hoffman, is particularly well suited to the development of strength in the lower portion of the bench press. Place the bar so that it rests firmly against your chest when hitting the pins above, and slowly increase your pressure on the bar until you are exerting full power, being careful to keep your whole body in the correct (for you) position you would be in if performing a full range bench press. In this exercise it is a good idea to take several breaths during your exertion in order to prevent capillary eruptions. Don't push at full power for more than 10 seconds. One exertion per training period is sufficient. Do one or two sets of this exercise after your regular bench presses. 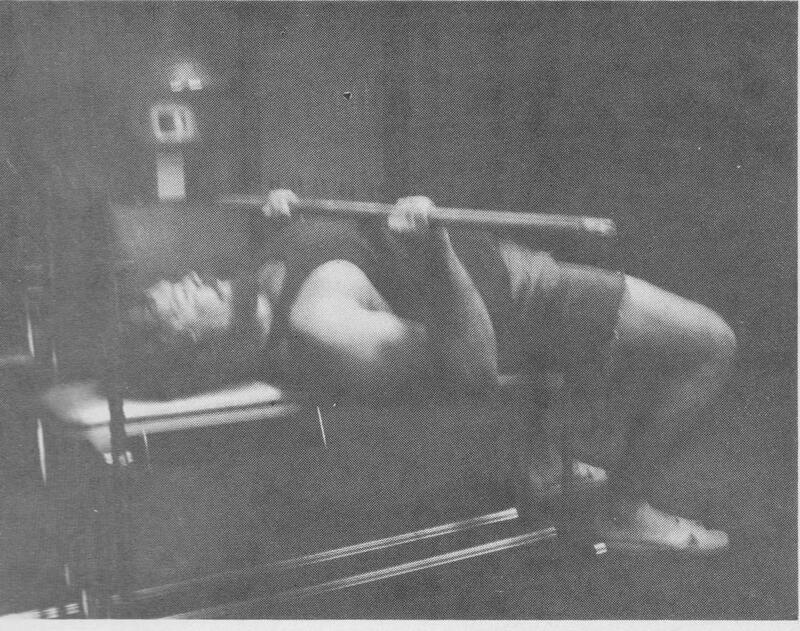 Above: Although a light weight is used here for photographic purposes, this snapshot shows the height to which the bar can be "driven" off the chest for practicing Bench Press Starts. This exercise is done by pausing with the bar on your chest anywhere from 2 to 30 seconds before you press to arms' length. Not only will the practice of this lift strengthen the beginning portion of the bench press, it will also help to keep you from losing lifts in a contest when the referee makes you wait longer than you'd expected before giving you the signal to begin. Ronnie Ray once did a 400 pound bench press with a 30 second pause at a bodyweight of 181. That about gets it for this first part. We hope that from now on you'll realize that what a man can lift is often due almost as much to his particular leverage as to his muscular strength, and that this leverage is often as easy to increase as strength. Once you understand this, you'll be well on your way to increasing your ability in the bench press or any other lift. In Part Two we'll discuss the total lift and also give you a few sample routines. Dr. Terry Todd and Evangelist Paul Anderson between sets in Paul's gym in Vidalia, Georgia. Last month, in order to facilitate our analysis of the bench press, we divided the lift, in an admittedly arbitrary way, into two parts - 1) the drive from the chest, and 2) the follow through. Having fairly well covered both the strength and leverage factors involved in the drive from the chest in part one, we hope to use this article to provide you with a few of our observations on both the follow through and the complete lift itself. To begin, we'd like to present a routine that is an archetype of the bench press routines used by top men in this lift. 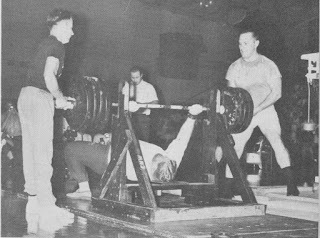 Routines of this general sort are favored by a majority of bench press record holders and therefore deserve our attention even if, in theory, ways exist to increase bench pressing strength even more rapidly than is possible through use of this prototypical routine. For the sake of convenience and clarity, let's assume that you are capable of a bench press of 300 pounds for one repetition and that you want to use the champions' routine discussed above in order to increase your limit. The poundages and jumps listed below, or ones similar to those, would insure that you were training in the same way that the big boys do. a. The lifter may elect to assume one of the following two positions on the bench which must be maintained during the lift. (1) With head, trunk, and legs extended on the bench, knees locked, heels on the bench, or (2) with head trunk (including buttocks) extended on the bench, feet flat on the floor. b. The referee's signal shall be given when the bar is absolutely motionless at the chest. c. At the referee's signal, the bar is pressed vertically to straight arms' length, and held motionless for the referee's signal to replace the bar. d. The lifter may use any method to bring the bar to the chest preparatory to the uplifting movement. e. The width of the bench shall be not less than 10 inches and not more than 12 inches. The height of the bench shall be not less than 14 inches nor more than 18 inches. f. If the lifter's trunks and the bench top are not of a sufficient color contrast to enable the officials to detect a possible raising of the buttocks, the bench top shall be covered accordingly. g. The spacing of the hands shall not exceed 32 inches measuring between the forefingers. h. In this lift, the judges and referees shall station themselves at the best points of vantage. i. For those lifters who elect to use position (2) and whose feet do not touch the floor, the platform may be built up to provide firm footing. 1. During the uplifting, any change of the elected lifting position. 2. Any raising of the lifter's head, shoulders, buttocks, or legs from the bench. 3. Any shifting of same. 4. Bridging in any form. 5. Any heaving or bouncing of the bar from the chest. 6. Allowing the bar to sink excessively into the lifter's chest. 7. Any uneven extension of the arms. 8. Stopping the bar during the press proper. 9. Any touching of the bar by the spotters before the referee's signal. 10. Failure to wait for the referee's signal. 11. Bracing against the bench with the feet. 12. Bracing shoulders against the uprights of the bench. One further reason for pausing in the bench press has to do with the extra development of the pectorals, deltoids, and triceps that occurs when these muscles are taxed over their full range of motion rather than over a partial range of motion which would be the case if the bar were "bounced" several inches off the chest - inches that are vital if maximum muscular size and strength are desired. 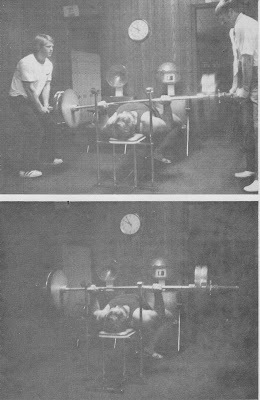 In other words, when the rebound method is employed, the bench press becomes a sort of partial lift, almost as if the bar were placed on supports so it rested three or four inches above your chest. The lack of complete development that would result from this sort of bench press is obvious once you think about it. So think about it, stop bouncing, and start growing. The same argument is true, of course, for bridging, which should be avoided under normal circumstances. Abnormal circumstances would include such things as a tack on the bench, a boil on the rump, or a very short bench. There are quite a number of assistance exercises for the bench press, all of them having their famous advocates. The one constant in all great bench pressers' programs is, of course, the bench press itself. In fact, the really great bench pressers have, with very few exceptions, been men who have spent at least five and usually ten years in specialized training on the bench press. We suspect that one of the reasons that our own bench pressing ability has never been in line with our overall body strength and in particular, our strength in other forms of pressing is because we never invested the five to ten consecutive years that the lift seems to require. Anderson in particular has spent little time on the bench press. He did the lift off and on for about two years during the 1955-1957 period and did (unofficially, of course) bench press 600 pounds. He did the lift again for several months during 1965 and has recently been training a bit on the bench press. Todd practiced the bench press on a regular basis for only three years (1964-1967) and registered an official best of 515 in 1967. The point is not that being the first to reach a 600 pound bench press is weak of that making 515 at a time when only three other men had officially matched or exceeded this figure is weak. The point is that other forms of pressing occupied the majority of our time and we registered what we consider to be superior poundages in these other lifts. Terry Todd performing a heavy bench press as loaders hand him the weight. 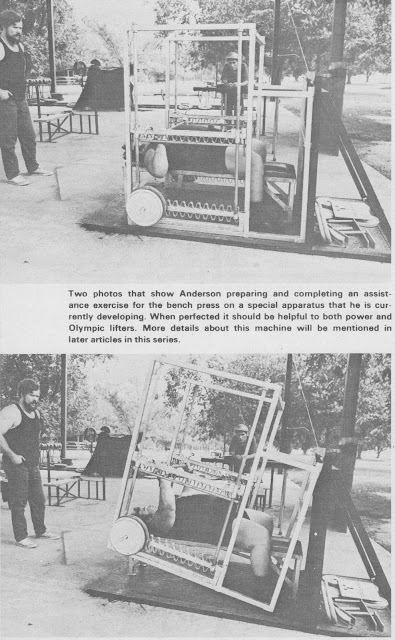 Anderson, for instance, has push pressed 565 and Todd did a strict, unsupported seated press with 385 at a time when the world record in the Olympic Press was less than 50 pounds more. It all boils down to the fact that those of you who are serious about your bench pressing should really specialize in the lift over a period of years because only in that way is it possible to truly excel. George Frenn, for example, while an excellent bench presser, has been kept by his hammer throwing from concentrating on this lift as he has on the squat and deadlift and so his performance on the bench has been less than phenomenal than his efforts on the other two lifts. Use either a power rack or do the exercise on the floor using supports. (See Photo below). Very heavy weights can be used. Paul Anderson doing partial press-outs while lying on the floor. The weight is in excess of 700 pounds. Pat Casey considered this lift to be the finest upper body exercise and also to be a great help in building bench pressing strength. Use as much weight attached to yourself as you can handle for several sets of from 3 to 8 reps.
Use a greater weight than you can handle in the conventional bench press and lower it, as you would a weight you could press, to the chest. You'll need help on this lift unless you have a power rack. Do this just after you finish your regular bench press workout (possibly even before your final "pump" set of high reps). Several singles should suffice. Williams and Kuc, the Scranton Supermen, have both employed this exercise in their obviously successful programs. Recent research, though not unanimous on this point, indicates that this type of exercise (called eccentric) will increase strength more rapidly than the more traditional technique of lifting the weight up and down (called isotonic). Recent research also suggests that accommodating resistance exercise (sometimes called isokinetics) is superior to both, but that's another story, too complicated to go into now. We are, however, working of a few of these nonconventional theories of exercise at the gym here in Vidalia (see photos below) and we hope to be bringing you further details of our research as we progress. One final world about leverage. Some people are admittedly gifted in the bench press and some are not. Mel Hennessy and Jim Williams apparently are. Bob Hoffman, although a very strong man in other areas, is not. But whether or not you have the advantage of favorable leverage in the lift, you can make great gains in both size and strength (I've seen Hoffman do high reps with over 200 pounds at 70 years of age.) through diligence and thoughtfulness. Thoughtfulness, for instance, is going to help you as you decide, through trial and error, which width is best for your particular body type. There is no way we can advise you on this matter because it varies amazingly from person to person. For some, the 32" grip is ideal; for others, a narrower-than-shoulder-width grip is preferred; and for others the 32" grip feels too narrow.